The theme of this quarter's concert is “Women in Big Band Jazz,” with special guest artist Hitomi Oba, tenor saxophonist and composer. Featured composer is Toshiko Ashiyoki, with “Notorious Tourist from the East” and “Strive for Jive.” (She is also the arranger.) Don Grolnick’s “Pools” (arrangement by John Fedchock) will feature student bassist Kumiko Maxson. 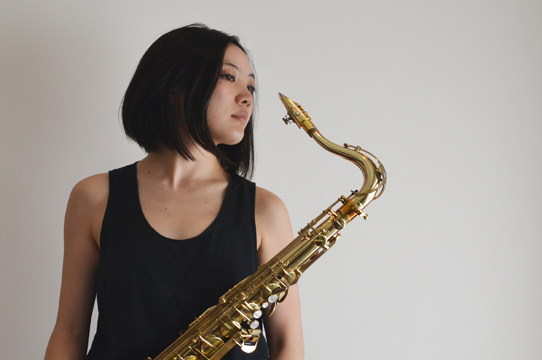 Hitomi Oba’s composition “Monuments in Red” has been especially arranged for the UCSC Big Band Jazz Ensemble. Throughout the concert, the women of the UCSC Big Band will be highlighted. Directed by Charles Hamilton. The Recital Hall has 386 fixed seats and offers space for 5 wheelchairs and guests/companions. Advance tickets available here at UCSCtickets.com.